It’s well-established that a lack of sleep can impair our cognitive function. Sleep loss has also been linked to adverse physical outcomes like weight gain and, increasingly, more serious maladies. Is it possible that lack of sleep can even explain the income gap? Those are just a few of the issues we try to figure out in this episode. But because sleep is such a big and interesting topic – and, let’s face it, it’s also kind of weird, the fact that our bodies shut down entirely for roughly a third of our lives – we are actually making two episodes about sleep. The second one will be released next week. + While the CDC recently declared insufficient sleep a “public-health epidemic,” are we treating the problem as seriously as we ought to be? + How legit are the sleep data that have traditionally been collected (hint: not very!) and what is being done to get better data? + Are we really sleeping a lot less these days than we used to, or is that argument the product of old, faulty data? And how has our sleep duration changed over time? + Who sleeps more: high-income or low-income people? Women or men? Whites or blacks? + Could sleep duration be a missing link in explaining the vast difference between health outcomes for whites and African-Americans? HALE: Generally, people who have more opportunities, more control over their lives, are also better sleepers. … Is it true that either racial minorities, low-educated, low job-security individuals, people who live in high-risk neighborhoods, who experience fear at night, are these people who clearly have some sort of social disadvantage, are also not sleeping as well? And is this impaired sleep affecting not only their ability to function the next day but their longer-term health outcomes? We talk with Hale about her sleep research as well as her own inability to put down computer screens before bedtime despite her own advice to do so. 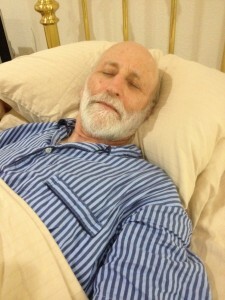 The economist Dan Hamermesh, shown here practicing what he researches, wrote a landmark paper in the economics of sleep. HAMERMESH: I think it’s a wonderful thing. They started this in 2003, it is by now the world’s largest ongoing, the only ongoing continuing study of how people spend their time. A tremendous revolution in data for people like myself. + Diane Lauderdale, an epidemiologist at the University of Chicago, who explains why so much traditional sleep data is poor and how technologies like wrist actigraphy are improving things. 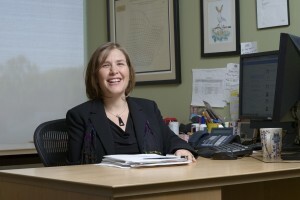 LAUDERDALE: It’s quite difficult to get accurate information about people’s routine sleep behavior. The obvious one is to ask people, “How much sleep do you usually get at night?” And that seems like it should be a great way to find out about sleep, just like if you ask people, “How tall are you?” or “How much do you weigh?” you get a pretty good answer. It turns out though, that sleep is hard. People don’t actually know the answer to that question. LAUDERDALE: What we found was on average, really large gender and race disparities. Women on average slept about an hour longer than men and whites slept, on average, about an hour longer than African-Americans. + Sherman James, a professor of epidemiology and African-American studies at Emory, who for years has been studying the black-white health gap. JAMES: We’re talking about … at least a twofold gap for the major killers, which would of course include heart disease and diabetes. In almost every category of health and disease, African-Americans lag behind whites, which is a very disturbing fact. … Despite efforts to uncover and elucidate the reasons for this persistent gap, we have achieved only limited insights. James has explored the notion of “John Henryism,” and whether blacks’ worse health outcomes may be due to harder working conditions and lack of opportunity. + David Dinges, a professor of psychology and psychiatry at Penn, whose research on sleep deprivation will can scare almost anyone into at least trying to get more sleep. PAUL HEINISCH: I start out with a weird sleeping pattern that I have to sleep with my feet up where my wife’s head is and then my head down near as close to the TV as possible with the TV on the full time. Let us know what you think of this episode and of course let us know your own sleep habits as well. First off a suggestion for a good night's sleep, which only took me 58 years figure out. #1 totally dark bedroom. #2 no clock insight. #3 a minimum of 45 minutes of nonstop aerobics daily. Now to the podcast. I believe Ms. Lauderdale cited a study that American African children of unwed Mothers had less sleep. Now does unwed in her cited study mean Mom & Dad are together and not married? Does unwed mean single Parent, no Dad insight? My suggestion for further study would be sleep patterns of children with both Parents versus children with no Dad in household. You could further break this down by ethnicity. Does the so-called John Henryism applied to American Latinos as well? I would like to know how the researchers consider the screen of, say, a Kindle Paperwhite, compared to a book. I bought this model of Kindle because I knew that I didn't want to read books on a regular backlit screen, which can cause eye strain. The Kindle looks very much like a book, at least when the light in the room is on. In a dark room, the amount of light is adjustable to a very low level. To me, it's very much like reading a regular book. But I am lucky enough to not have trouble getting to sleep in general, so I'm not sure if it would bother me either way. I bought a Kindle paperwhite for the same reason. Amazon and other sites said that Kindle paperwhite does not emit blue light. I personally think it is much better for bedtime reading than using my phone (which I did before getting the Kindle). Another option is to get a bulb that doesn't emit blue light for your bedside table. I think there are multiple reasons for the black-white difference in health. In addition to John Henryism, socioeconomic issues, one researcher cites vitamin D deficiency in blacks resulting from having dark skin and living in North America. I have more confidence in the research with the fitbit. High blood pressure runs in my family. I sleep six hours a night (fitbit confirmed). On good nights I wake up six hours or less after I go to bed no matter what time I go to bed. On other nights I suffer from insomnia. Both my mom, and my daughter also suffer from insomnia. I raised my daughter with a very stable bedtime routine. My mom did tell me that her insomnia was from stress. I've use exercise, meditation to help with insomnia. Life is good! Can't wait to hear part II of sleep. I'm not sure where to post this, but I was wondering, how does economics fit into the internet world? Reddit moderators and Wikipedia editors and contributors work for no monetary value. What fuels thousands of people to commit their time to the Internet? We all spend time on Facebook, emails, ect, but what fuels the masses to contribute free time to free information, why does this work? Very interesting question I would love to hear a podcast on this topic! Is the contributor mission driven or just bored? Does the individual have an incentive at play that is unknown to the rest of us? What is the possibility of having wikipedia and reddit secretly paying only specific contributors for larger or popular topics. The answer to these questions address a larger picture question which is: What is the relationship behind individuals and online communities? Myself writing this comment/reply stands alone as an example. Those of you who are reading this comment also play a small part to the community. On top of all of this, there is a like button, go figure. We must have an answer! I laughed when I heard Mr. Dubner say he sleeps with eye mask and earplugs--so do I! Years of night shifts started me in the habit which I've continued even after transitioning to working daylight hours. Now instead of wearing earplugs I listen to podcasts. 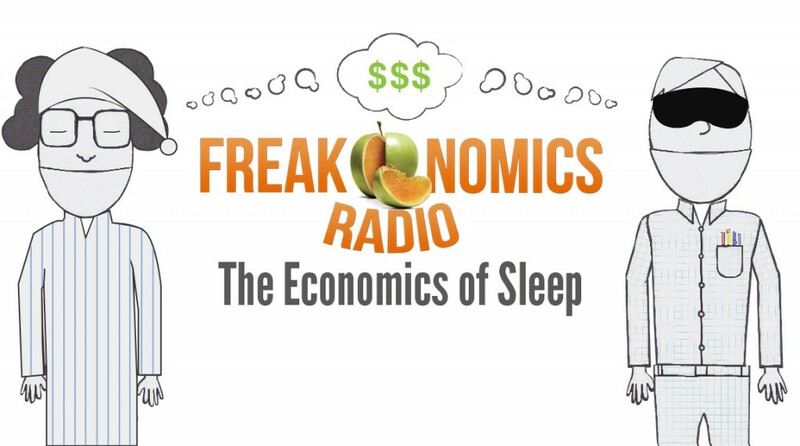 Freakonomics is one of my favorite podcasts to listen to overnight. Years ago I didn't value sleep, but have come to respect the need for sleep. When I don't get enough sleep, my appetite increases and so does my waistline. I wore my Fitbit overnight for a few months and determined sleep efficiency is consistently over 93%. My rhythm seems to be about 7 to 7.5hrs per night and have become more disciplined about going to bed in time to get 7.5-8hrs. I started using an app on my phone that works similar to that wrist watch thing. You place the phone on the bed near your head and it uses the accelerometer to sense your movement and it uses the microphone to record snoring. It tells you how many deep sleep REM cycles you had a night and how much sleep you lost because of snoring. It gives you lots of data and graphs. Maybe the researches could use something like that to get much more data from many more people. It's on Android and called "Sleep as Android"
I'm quite surprised that Dan Hamermesh is not considering the quality of sleep. I can sleep 7 hours each over two nights and have profoundly different results. I've used a Zeo sleep monitor and know much about my sleep profiles. If I don't have a deep sleep, for 45 minutes within the first 2 hours, I'll have a horrible following day. I always have about an hour of deep sleep about 2 hours before I awake. So, if I don't get that good profile with two deep sleeps, I feel crappy and cannot function well. Alcohol will impact the first deep sleep but not the second (I probably sober up by 5am) and I feel horrible the next day. So, the sleep quality and characteristics are extremely critical to my physiology, and probably my long-term health. I also sleep with earplugs and a nose-strip. I've started keeping an eye guard near my bedside in case I awake too early and the sun is coming through the window. Do you think every headline has to say a radio broadcast or whatever? On my screen, I can't even read the paragraph teaser description underneath. Radio re-broadcast. Got it. Don't care. Have any studies looked at sleep patterns by location (rural, suburbs, and urban)? Be interesting to see how that impacts quantity and quality of sleep. This was a very interesting video but also a very eye opening video at the same time. To here that on average African Americans are getting less sleep due to the fact of having less money and being forced into situation where they don't get the sleep they need is bad. We need to find away to make it to where it's more evenly spread where everyone can get the sleep they need and deserve. Social class shouldn't mean you have more privileges than others. That doesn't make sense we can't go on like this much longer. Given up trying to listen to this because of the music track. Why is it there? I found this podcast to be fascinating as well as frightening. I have had chronic insomnia for several years. I work in sales and my mind does not like to let me sleep. The lack of sleep has hurt my health, put unhealthy pounds on my midsection and has negatively impacted my relationships. I have tried pills, sleep studies, herbs and oils. No luck. Do I quit? Like another podcast suggests, or develop more grit? To hopefully keep my job, marriage and improve my health, I would be curious to find out if an induced coma for a weekend is worth the risks? I do not know the risks however. Call it changing the oil? The body has a chance to rest, we don't consume the toxins we often sacrifice for time. Contained in a controlled environment under supervision, we could potentially peacefully rest and partially heal the body and mind every quarter or so and improve our current life without having to sacrifice our health, marriage and bank account. Is this ethical or worth it? I would take the risk. Holy cow was this boring. Have you been slacking lately? People just kept saying the same stuff, over, and over, and over... Right, so we don't know that much about sleep. Got it. Do we need two parts of this? Turned this one off halfway through and won't be visiting part two. Your "sleep prescription" has changed my life. :-) I listened to this podcast about 10 days ago and decided to try it. No Kindle between 9 P.M. and 7 A.M. Amazing! Have slept better every night since then. A couple of nights ago, I slept 8 hours straight which is a rarity, and last night I did it again. Yay! I have had a lot of trouble with disturbed sleep for about 4 years and didn't know why. That's about the time I got my Kindle Fire. DUH! I''ve been searching for the data from the ATUS survey and on the BLS website, all i've been able to get were aggregated data on average sleep. Are the raw data (disaggregated) available? Does anyone know if its available anywhere?